Balbo Beard Co Parma Violets Beard Oil has been a disputed scent in the Richardson household! I cannot stand the Parma Violet sweets, which is strange as I do like the flowery flavours in chocolate but for some reason these sweets feel like I am drinking a 1900’s grandmothers perfume! On the other hand wife loves them and so do my daughters and so they were very interested when I told them that one of the Balbo Beard Co Retro Sweet Shop scents was Parma Violets. The base for this and all the oils is a blend of Grapeseed, Jojoba and Argan carrier oils and what a cracking oil, you can feel that this is a blend of high quality oils and it leaves my beard feeling soft and looking healthy. The scent, well I always knew it wasn’t going to be for me and as I sat there deciding on how to mark this oil, my wife gave her opinion and said that the scent of this oils gives her the taste and memory of eating these sweets and that just because I didn’t like it, that didn’t mean it wasn’t good and so I was ordered to give it the ‘Golden Beard Award. Now it is very rare for her to do this and so I know that this must be a damn good scent that captures the Parma Violets scent perfectly. 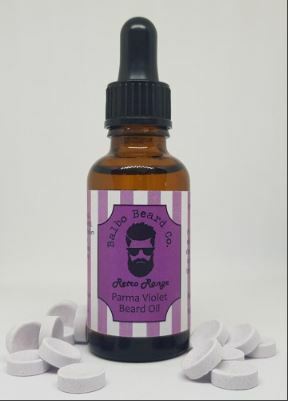 The Balbo Beard Co Parma Violets Beard Oil comes in a 30ml glass bottle with a glass dropper and costs £9.99 from the website.